Jury assessment: The project Our City, Our Collective shows a clear idea and strategy on all scales. 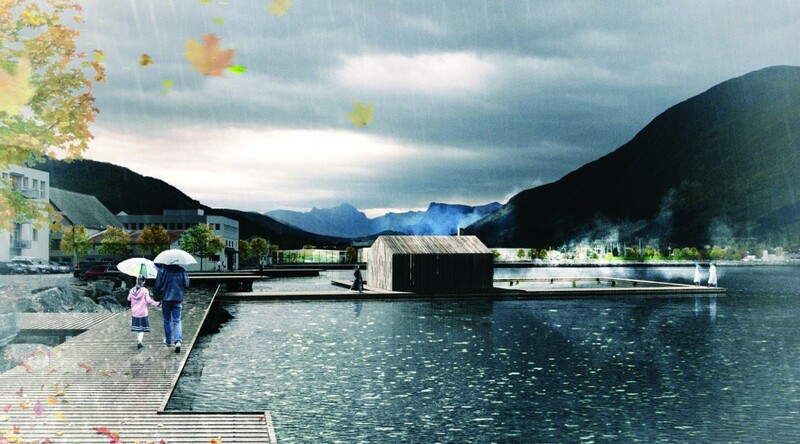 On the larger scale, the project recognizes the water promenade and the water body of Store Lungegårdsvann as a garden for the city – a central park – with an importance for Bergen as a whole. Through continuing and reinterpreting the neighbouring urban fabric of the student housing, the project proposes two hybrid city blocks consisting of a common porous ground floor that responds to urban connections in its surroundings, while the upper floors resemble two larger perimeter blocks. The proposal shows a richness in ideas and guidelines for a cooperative housing pilot and how to active the use of the waterfront. In this project, the urban structure corresponds well to the scale of the lake and is making a clear and appropriate distinction between the public park and the project. The private and public functions on ground floor level are attractive and intriguing, providing room for a variety of shared spaces while the two larger housing perimeter blocks add a positive critical mass to Grønneviksøren as a whole. The proposal shows a variety of different apartments for all generations, not only the ”young family”, adding a series of shared facilities such as community kitchens, homework communities, after school centres, senior housing community and gardens; however, apartment sizes and layouts should be elaborated further to reflect these common facilities. 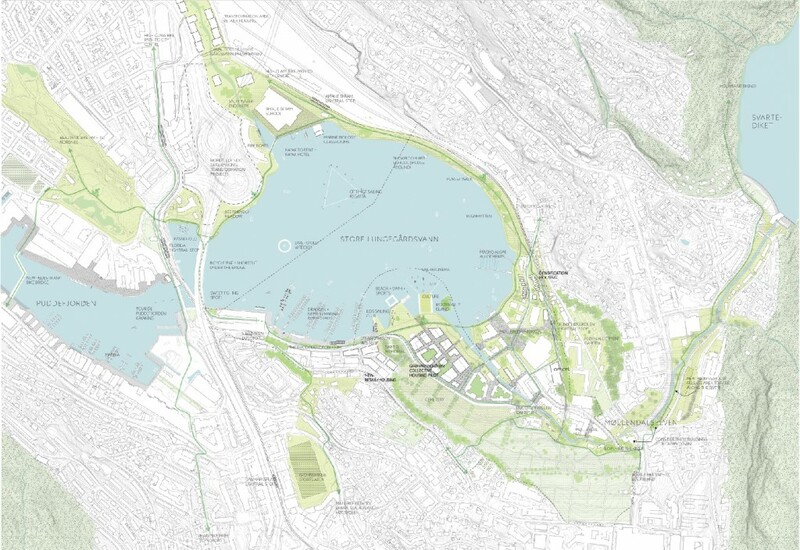 The proposed city scale of the public space along the lake is workable and supports the strategic vision of envisaged socio-cultural connections. The jury sees a need for elaborating the architecture and the physical expression of the development as a whole, but are optimistic about the further realization of this proposal since the scheme seems robust enough to withhold the coming development process. 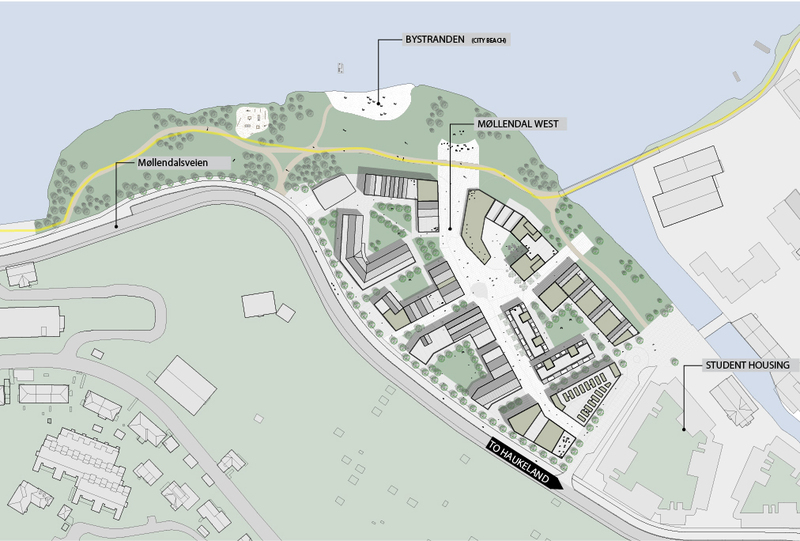 Jury assessment: The project Møllendal West gains distinction with its proposal on developing a non-profit housing strategy in Bergen that challenges the traditional property development in Norway. The premise of the proposal is the conviction that the current housing shortage and rise in prices is partly due to lack of innovation. 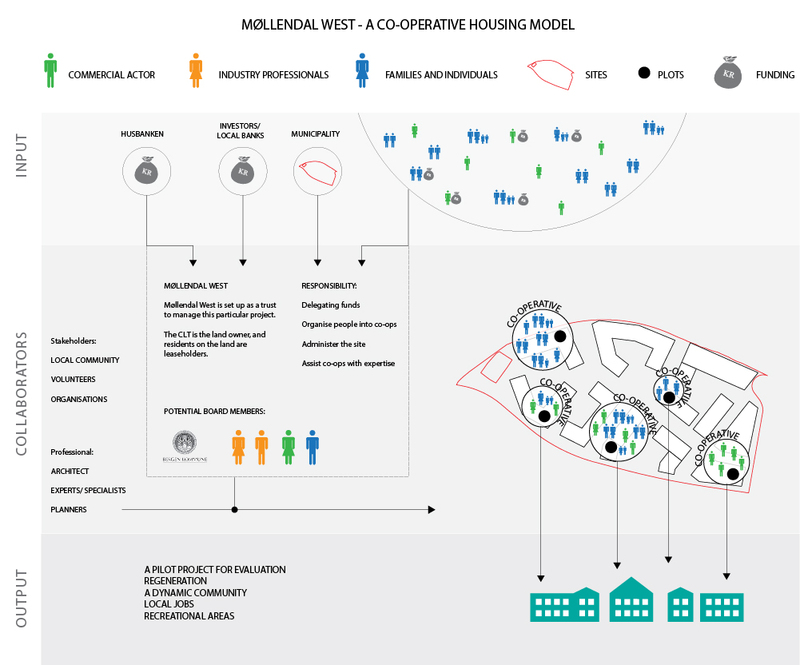 The project studies the desire of the population as well as existing economic, financial and political models of development and counteracts the current situation by suggesting implementation of a cooperative housing model. 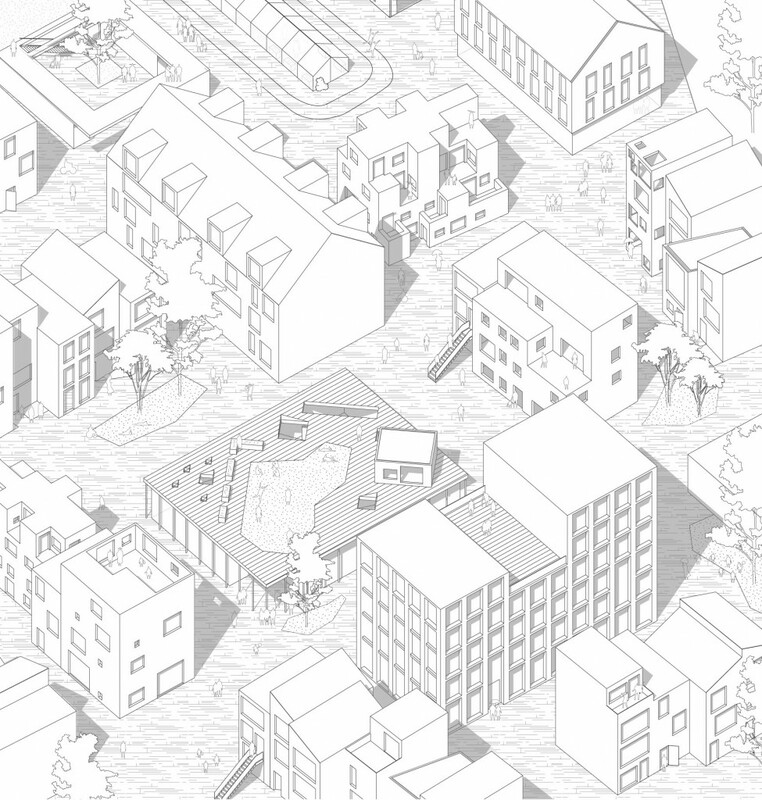 The urban scheme suggests a density somewhere between the city and suburbia by mixing two typologies. While neither the typology nor the urban plan is remarkable, the project is seen as a strong comment on how to build a neighbourhood in a fast growing city. In this sense, the proposal is complimentary to the winning proposal that pinpoints important aspects to consider for the municipality when developing Grønneviksøren as a pilot project. Jury assessment: Her har eg mitt hjerte, her har eg mitt ly challenges the usual methods of construction related to affordability and typology. The project emphasises the concept of do it yourself and develops a construction system illustrated in a housing catalogue with a set of basic rules for how to put together your own housing modules. The raw housing module, easily transported to the site, allows for “creativity with predictability” and the inhabitants develop a sense of community and a set of shared functions through the process. The first step of preparing the site for development is cleaning the polluted ground with the use of Phytoremediation. The goal of “leaving the site in better conditions than we found it” intrigued the jury who could imagine this process going parallel to the planning processes. The project was discussed as an interesting method with a strong focus on self-initiated processes and communal city living. The plan however, shows a lack of density and hierarchy of urban spaces despite of many good intentions and analysis. The jury believes the strength of the project lies in addressing and pushing models of housing developments in Norway, and that a do it yourself strategy on a large site as Møllendal would be an interesting experiment.